Do you love to decorate for fall but orange and black don’t fit into your home decor? I love the look of milk glass– antique white glass items that transition beautifully between holidays so you don’t have to constantly change the look of a room. 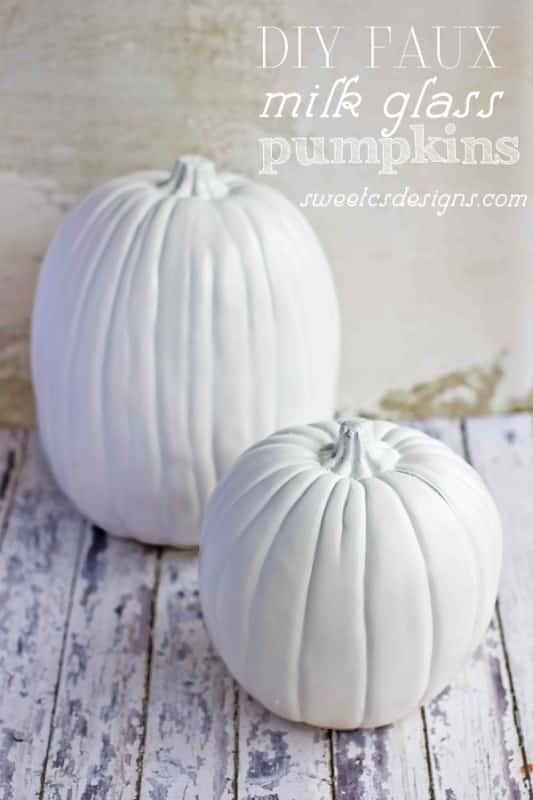 These faux milk glass pumpkins do just that! You can start incorporating them into your home decor in summer and the harvest months, and keep them up well into winter. The best part about making your own diy faux milk glass pumpkins is that it takes minutes to get a beautiful antique look that looks like glass- from foam or rubber pumpkins! First off, you’ll need plastic or foam pumpkins. I bought some funkins that were an offwhite color with a brown stem- i wanted them completely white. Next, get a good paint + primer spraypaint in a glossy finish. I really love Valspar spraypaints from Lowes because they have a great locking top so my kids dont get into them! 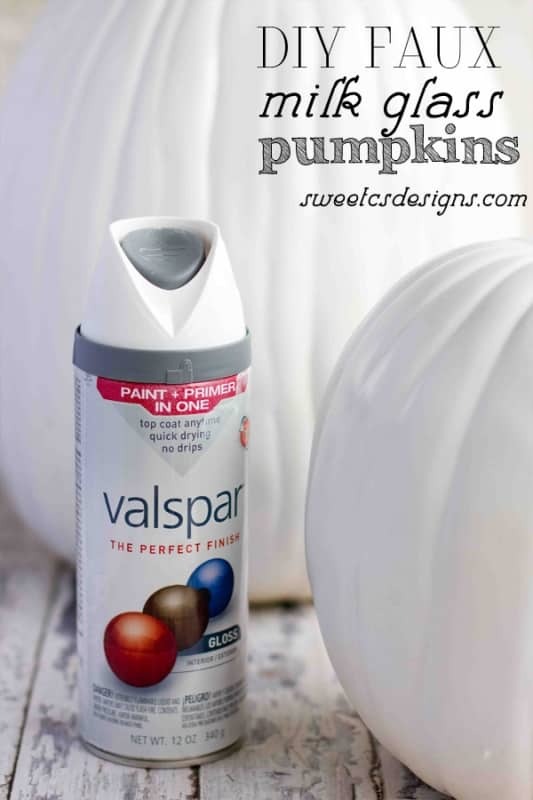 Using an even spray, go back and forth over the pumpkin, starting at the top and work your way down. Don’t spray to thick or you’ll get drips. When dry, turn the pumpkin upside down and repeat. Let fully dry (a few hours, depending on where you live and how humid it is). Add to vignettes, tablescapes, shelves- wherever you’d like to add a touch of fall without taking away from an elegant, antique feel! Previous Post: « Fight Allergy Face with Zyrtec! These pumpkins are gorgeous! I am really not a traditional decorator when it comes to holidays and seasons so these would fit in so great in my house. Elegant, classy, and subtle. And so easy! I am pinning and doing this for fall! Thanks for the inspiration! Where did you pick up your pumpkins? I’ve had a hard time finding any that aren’t super tiny and that don’t cost a fortune. I love the milk white. I love creating decor that I don’t have to throw out, it feels so wasteful to do so. If you live near a Hobby Lobby,they have the foam ones at 40 percent off right now and these pumpkins are ute! Adorable! I blogged about fall yesterday! I’m so ready for cooler weather and new decor! I love these!!! It is never too early for pumpkins! Good idea! Is it time for pumpkins already?